An new-energy vehicle is charging in the special parking spot in the B3 garage of Shanghai Times Square, Shanghai on Februrary 15, 2017. Wide location coverage and all-time access is the model's advantages to attract users. Just one day after the New Year holiday in 2019, Wang Lifeng, a top executive of a Chinese car-sharing start-up, had already been surrounded by a group of people in a police station in Beijing's Liulitun for one reason: asking the entrepreneur to refund the deposits placed in the company's app Togo. Along with the users, a group of Togo employees were also present, asking their boss to pay salaries that had not been paid for more than six months. The Auto Business Review reported that it was actually Togo staff that had made public Wang's location. Togo, a Beijing-based car-sharing internet platform founded in 2015, has been hitting the headlines recently due to speculation of cash flow problems, coming just days after the bike-sharing start-up ofo conceded its "immense" cash flow problems and had considered applying for bankruptcy last month. 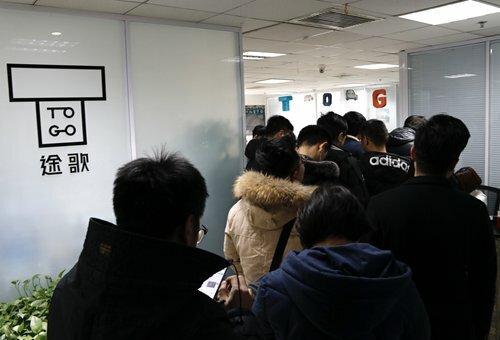 Questioned by users at the police station, who had not received their deposits of 1,500 yuan ($222) per account, after applying via the Togo app for more than three months, Togo CEO Wang said "the company is really not doing well at refunding deposits at the moment," according to the magazine report. Over 3 million users are registered on Togo's app, according to media reports, which means the amount of deposits paid could total 4.5 billion yuan. Togo's PR cannot be reached as of press time. A Beijing-based white-collar worker surnamed Jia told the Global Times that "I like driving by myself but it has become a once-in-a-blue-moon thing in Beijing, if you want to obtain a license for an internal-combustion car nowadays. And it is said that one must have to wait for almost a decade if you want a license for an electric vehicle." "At this point, I find the car-sharing business feasible and convenient, meeting the needs of people like me," Jia noted. However, Jia has become very cautious of deposits after his 2,000-yuan-deposit disappeared forever in 2017. "I tried a car-sharing app called EZZY just once, and my money was never returned even though I personally visited the company's headquarters in Beijing, wrote emails and called several times. No response was given." EZZY announced bankruptcy proceedings in October 2017. It had entered the car-sharing sector with strategies such as only adopting high-end cars for its users like the BMW i3 series or Audi A3, and restricting its operations to only Beijing's core areas like Guomao and Sanlitun. Having used Togo for four to five times in the past year, Jia said he applied for deposit refund after completing an order, as he had found the company had dramatically reduced its fleet of vehicles, after the cash flow issues became public. Yu Mu, an industry analyst at Beijing-based research company Analysys, told the Global Times that compared with other car-sharing operators, (those that have investment and vehicle resources from car makers), the internet start-ups like Togo usually consider the users' deposits as an important source of operating capital. "When their funds raised from venture capital investors run out, they tend to rely on the customer's deposits for their up- and down-stream companies' cash flow as the industry is really capital-intensive," said Yu. "Only those with vehicles and capital at hand can find a way out," he added. The Togo deposit crisis came soon after its latest fundraising, just back in October 2018, when it secured a B2-round of fundraising worth tens of millions dollars led by SIG. Car-sharing, or in fact, timeshare car-rental business, took root in China in as early as 2011, industry analysts said. Unlike traditional car-rental services which deal with customers "over the counter", the current car-sharing model refers to services where users can gain access to vehicles, often by the hour, through a finger touch on their mobile phones. This new model is available thanks to the rapid development of internet technologies, and is similar to the way that bike-sharing companies have developed. Most of the vehicles are the new-energy vehicle (NEV) type, spreading across major cities such as Beijing, Shanghai, Guangzhou and Shenzhen. Despite starting earlier than the bike-sharing sector, the car-sharing model has not yet embraced the capital's favor, while the bike-sharing has made a good use of the capital's favor over the past two years, Yu noted, adding that it also seems hard for car-sharing to develop in the future, because capital is generally cautious when considering substantial investment. Zhu Dajian, director of the Sustainable Development and New-Type Urbanization Think Tank at Tongji University, said the battle for capital and developing a sound business model to increase market share and profitability has proven too much for both the bike-sharing and car-sharing markets. "This is not the right path, struggling to get the upper hand from the outset," said Zhu, adding that without technological innovation, user convenience and user-friendliness, the sector will run into a dead end. Compared with bike-sharing, car-sharing has much higher thresholds on both the supply and demand sides, Zhu said. "Such issues as difficulty in finding parking space and vehicle re-charging points still need to be dealt with," he noted. There are three main kinds of players in the car-sharing industry in China - platforms born out of original equipment manufacturers (OEM), traditional car rental companies and internet start-ups. The former two types of industry players might find it easier to stay on track compared with the internet start-ups, but at the end of the day, most of them are still troubled with one key issue: how to make profits with such high operational costs? Shu Liang, an industry watcher and managing partner at Shanghai-based Estar Capital, told the Global Times that the core problems surrounding the sharing business or timeshare rental business, in general lies in two areas - inelastic demand from the users and high usage frequency, both of which will be required to guarantee revenues and then realize profits. "Industry restructuring is happening, as some players cannot afford to cover their basic costs, while some others are still expanding," Shu noted. 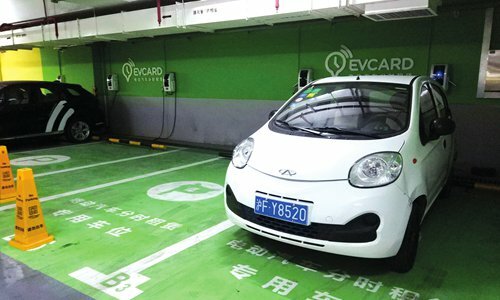 For example, Shanghai-based EVCARD, a shanghai-based electric vehicle (EV) car-sharing company backed by SAIC, and one of the country's largest hourly car rental services providers founded in 2015, said it would announce on Wednesday the operating fleet of its Roewe Ei5 brand EV had reached 10,000 now versus 6,000 in 2017, according to a statement the company sent to the Global Times on Tuesday. Gofun Chuxing, an EV-sharing service platform under State-owned car-rental and taxi firm Beijing Shouqi Group, has expanded its operations to nearly 80 cities, with more than 1.5 million registered users nationwide, as of September last year, according to a note the company sent to the Global Times over the weekend. The company is betting on explosive growth this coming year. The fallout of ofo and Togo cannot be blamed on the sharing economy itself. The sharing economy is an unstoppable trend, especially for future mobility in the next 20 or 30 years, Zhu said, adding it is crucially important to survive and then thrive step by step. The potential market value for China's car-sharing market may be 1.8 trillion yuan in 2018, according to the estimate of consultancy firm Roland Berger. The ride-sharing industry will gradually become dominated by online ride-hailing and car-sharing from 2020 to 2025, it predicted. Chen Qingtai, president of China EV100, an EV association of over 200 leading Chinese electric mobility companies, told the China EV100 Forum over the weekend that more and more Chinese consumers are holding the opinion of "less ownership, more sharing." Shared riding, including ride-hailing and car-sharing businesses, are becoming more popular by meeting the mobility demand of different groups of people. One platform alone - Didi Chuxing, the ride-hailing giant in China, has served 550 million users with over 10 billion trips in 2018 , across 430 cities in China, Chen noted. Abdul Haleem, an Indian medical doctor by profession and currently doing the master degree in Nanjing, East China's Jiangsu Province, is a steadfast fan of shared cars. He told the Global Times on Monday that "it's developing day by day by implementing new technologies and getting more popular among the people." "I can see a big future for the industry as it helps save energy, decrease traffic congestion and reduce pollution," Haleem said. Using the shared cars operated by EVCARD almost on a daily basis since he moved to Nanjing in 2017, Haleem said "it is very convenient as we don't need to worry about finding a parking space, maintenance and repairs, and mostly they provide brand-new cars." "Currently I think India has not yet even started shared-car services like the ones we see in China. In India, we only have car rental services which we can reserve and use with the help of mobile apps. In addition, EVs are not that popular in India yet," he noted. In his meeting with Chen, Indian NITI Aayog Principal Advisor Anil Srivatsava said that given the market size of India and China, there is huge cooperation potential for EV industries of both countries, according to a press release from the Indian Embassy on Sunday. During the China EV100 Forum, representatives from the US, Norway, the Netherlands and the UK have all expressed their faith in the trend of future mobility marked by a shift from car ownership to car sharing and the cars are no longer the traditional internal-combustion vehicles. The global auto industry has come across a revolutionary change after decades of development, industry insiders said, and China, the world's largest vehicle market, cannot escape such transformation. Data from the China Association of Automobile Manufacturers (CAAM) showed on Monday that passenger vehicles sales totaled 22.35 million in 2018, down 5.8 percent year-on-year, the first negative growth for the market in 28 years. However, amid the reduction of overall auto sales, the NEV sector has witnessed robust growth in the past year. NEV production and sales reached 1.27 million and 1.26 million, up 59.9 percent and 61.7 percent year-on-year, according to the CAAM. With EV hyped as the new engine for the nation's auto economy and new mobility services, such as car-sharing and e-hailing, eating into the overall auto demand, the auto industry will find itself on a new growth track featuring less pollution, better traffic management and higher efficiency, supported by new technologies.